Wow, I’m really behind. We finished this wine more than a week ago. Then we immediately jetted off to Napa for a long weekend to celebrate our seventh wedding anniversary. (And we took the kids!). Given that I’ve tried at least three dozen other wines since I had this wine, and endured one of the worst colds I’ve had in years (complete with laryngitis) this is going to be brief and almost assuredly less interesting than if I had written this post within 48 hours of drinking the wine as usual. So... this merlot from Seven Hills was very purple with ruby edges. The nose was full of cherries as well as oak. It was very fruity, like jam. It was very easy to drink, and was not as fruity as I had expected given the nose. The toasted oak flavor was present, but not overwhelming. I also tasted blackberry and the slight bitterness of coffee. Overall, a good wine. Despite its less than stellar reputation recently (thanks, Sideways), I find that I quite enjoy merlot. I haven’t had the opportunity to try a lot of ice wine, mostly because it tends to be so pricey. But first, a quick lesson in the making of ice wine: True ice wine is made from grapes that are frozen on the vine. The sugar inside the grapes doesn’t freeze, but the water does. When pressed, a super concentrated juice results which is then fermented. It’s made in several countries throughout the world, but the most famous ice wines are made in Canada and Germany (where it’s called Eiswein). This bottle from Kiona was quite the comparative bargain at only $23 and is made from Chenin Blanc. Instead of a foil top it was covered in wax which presented me with quite the challenge. If anyone has tips on the best way to open a waxed bottle of wine please do share. I finally managed to crack and then break off the top to get at the cork. There has got to be a better way! As I’ve come to expect from sweet dessert wine, it was golden honey in the glass. It also smelled of honey, carmel and a super sweet peach pie with vanilla ice cream. Tasty. I’ve been smelling a lot of peach pie in my dessert wines lately-- I think my nose is trying to tell me something. The wine also tasted of peaches (sans crust) and while it was certainly super sweet (the residual sugar is 26.8%) it was also balanced and a bit tart by its acidity. Not a super long finish though. As I drank the rest of my first glass, as well as subsequent glasses (on other nights! ), I was really struck by what the wine really tasted like: Welch’s white grape juice. And not in a bad way. I LOVE white grape juice. I used to love drinking it as a kid, never cared much for the purple stuff. White grape juice was both more tart and less likely to leave a stain. This wine is a grown up version of my favorite childhood juice. Wine that tastes like grapes... weird, huh?! It hot again in Northern California. Isn’t it fall by now? One of the only reasons not to be irritated by the heat is that it's great weather for a nice cold glass of riesling. Since I love riesling oh-so-very much and this has to be one of the most written about rieslings (at least in what I read! ), I was really looking forward to it. I mean, the wine even has its own website. And lucky me, I was tasting the 10th vintage. According to Eroica’s website, Chateau Ste. Michelle produces more riesling than any other American region, making seven different kinds. Among them, their “standard” riesling that I used to drink practically by the case in my early 20’s. The Dr. Loosen side of things comes from Ernst Loosen, part of a winemaking family that has been making riesling in Germany’s Mosel region for more than two centuries. 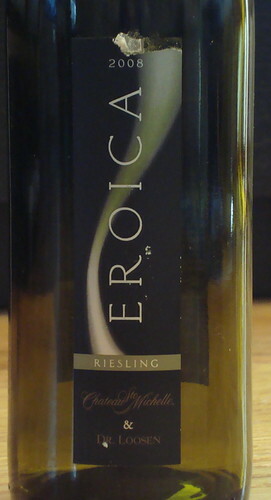 Together they produce three different Eroica rieslings grown in Washington’s Columbia Valley. They have twice produced an ice wine, when the conditions were just right in their Horse Heaven vineyard, in 2006 and 2008. They also produce a single berry version, in the Trockenbeerenauslese style. A word that I simply cannot pronounce, probably even if I did have a reference for the proper pronunciation, that translates to selection of individual grapes left on the vine until nearly dry or trocken (i.e. raisened). They also allow botrytis to settle in. This produces a wine not that unlike Sauternes, I would imagine. I tasted their off-dry version, the Eroica “widely” available. It was very pale yellow in the glass. While I likely served myself wine that was a bit too cold, I went ahead with my tasting. The nose was light (but was certainly affected by the cold temperature) and had a slight tropical scent, like pineapple. Being riesling, it was citrusy-- like white grapefruit. I thought it was fairly light for an off-dry wine. I always expect something fuller, but this was still light and refreshing. Must mean it's properly balanced. It was very citrusy, again with white grapefruit as well as lime. The acidity was nice and there was a hint of minerals. I especially enjoyed the super long finish. Yum! I’ve never been to Washington, but I’d like to go. Its on my list of Pacific Northwest locations I’d like to visit. I’ve done Portland, Oregon, but still need to hit Seattle, Spokane and Vancouver, BC. (Nevermind that none of these cities are particularly close to Washington “wine country”!) While I wait for the opportunity to visit these places, I thought I should hit on a domestic location in my wine tasting. Washington seemed fitting given that one of my former go-to wines is a Washington native (the Chateau Ste. Michelle Riesling). 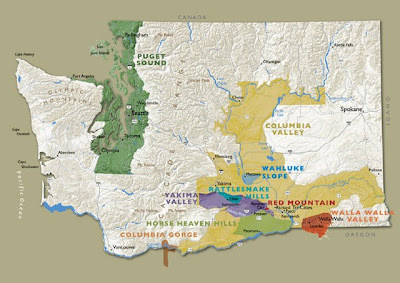 Most wine is grown in Eastern Washington, over the Cascades from Seattle and generally along the Oregon border, in the Columbia Valley. 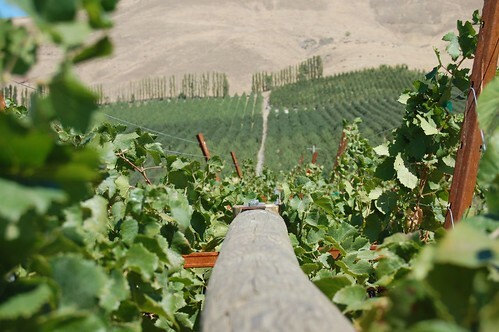 The Columbia Valley is an AVA that contains several more specific AVAs including Yakima Valley, Red Mountain, Horse Heaven Hills and four others. 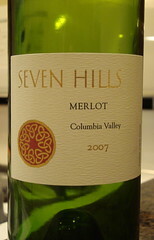 Columbia Valley seems to be the preferred designation on many Washington labels. In stark contrast to the Western part of the state, where people likely envision the near constant rain of Seattle, Washington’s wine country is a semi-desert with a continental climate. It also happens to share the same latitude of Bordeaux and Burgundy in France. The growing season is short, however the sun shines most reliably in the summer and it rarely rains, which keeps disease at bay. The winter on the other hand is just downright cold, and while that can be rough on the grape vines (i.e. kill them), it has also kept phylloxera away and apparently most of the vines are planted on their own rootstocks. Chateau Ste. Michelle is owned by the dominant winery in the state (that also owns brands such as Columbia Crest and many others), but they have also played a large part in helping raise awareness of Washington wines. I picked up a riesling, which is the third most planted vinifera grape variety in the state behind #1 Chardonnay and #2 Merlot. This particular one is a popular joint venture between Chateau Ste. Michelle and Dr. Loosen, (an extremely popular German winemaker). Nearly every book I read that talked about Washington wines mentioned this wine. It's one of the few specific wines on my tasting list. 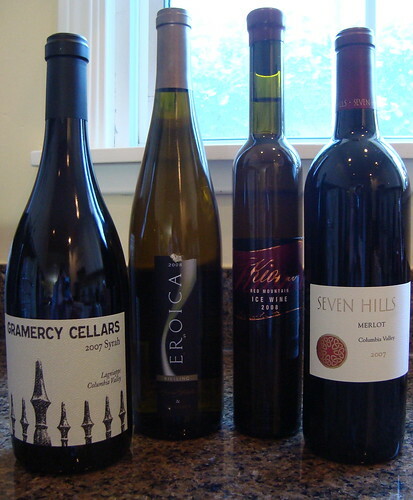 When I was at K&L buying the wines I was fortunate enough to be helped by an employee (whose name I missed, darn it!) that said he had just returned from a Washington wine trip. He said he’d had the opportunity to meet the winemakers from Gramercy (whose Syrah I chose) and Seven Hills (merlot), which he described as “delicious”. And, of course, there’s always a wine that’s somehow unusual that I can always be counted on to buy. This time it's an ice wine. I did some research before deciding to get it and found that in the vast majority of Washington vineyards the grapes do not freeze reliably enough for most wineries to produce ice wine (for example, Chateau Ste. Michelle has only made one a handful of times), but Kiona has a small patch of vines on Red Mountain that allows them to make one every year. At only $22.99, who can pass that up?! I love Pinot Noir. Maybe its because I know just how darn hard it is to grow the grape. Maybe its because I know just how darn hard it is to make great wine out of the grape. Maybe its because it tends to be softer wine which on many occasions I prefer. In any case, I was rather looking forward to tasting a pinot noir from Australia, a place where big, bold wine seems to be king. I feel especially lucky to be trying this particular pinot from Yeringberg because apparently they made only 20 cases of it. Only 240 bottles and I have one of them! Yeringberg seems to be a small family winery who has been making wine in the Yarra Valley for 150 years. I say seems to be because I barely have more than the label from which to glean my information. If you click through to their website you’ll see what I mean. Winemakers, yes; website-makers they are not. A local wine website tells me they have 4 employees, all in the de Pury family. I’m a little amazed this bottle of wine has managed to land in my Northern California home! This is probably one of the oldest pinots I’ve had, a 2004. Seems silly, but I’ve really only discovered pinot in the last few years. It never used to help that good pinot was out of my price range. This one was showing its slight age in the brick red color of the wine. On the nose it was smokey with a hint of black pepper. I sensed dark berries, almost like jam- blackberry jam. It was light to medium-bodied and had the spicy pepper taste I expected given how it had smelled. It was earthy and round and tasted like nice smokey bacon. Now there’s a wine I can get behind! I thought it would go well with food, as pinot noir often does, and I was right. We poured a bit more with dinner: baked sweet chili salmon, apricot and raisin bread and a side of steamed broccoli. I would also like to publicly give myself a shout-out for making salmon that turned out awesome! A great meal with great wine.